TEHRAN, Iran (CNN) -- Iran's parliament speaker has criticized U.S. President-elect Barack Obama for saying that Iran's development of a nuclear weapon is unacceptable. 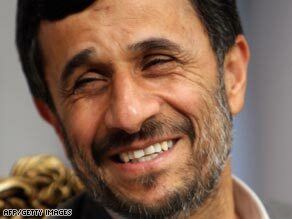 Iranian President Mahmoud Ahmadinejad has outlined where he thinks U.S. policy needs to change. Ali Larijani said Saturday that Obama should apply his campaign message of change to U.S. dealings with Iran. "What is expected is a change in strategy, not the repetition of objections to Iran's nuclear program, which will be taking a step in the wrong direction." Larijani said that U.S. behavior toward Iran "will not change so simply" but that Obama's election showed internal conditions in the United States have shifted. He added that Iran does not mind if the United States provides other Persian Gulf countries with nuclear technology, but "you should know that you cannot prevent the Islamic Republic [from reaching its goals in the nuclear field]," according to the news agency. Obama cautioned Friday that it had only been a few days since the election and that he was not in office. "Obviously, how we approach and deal with a country like Iran is not something that we should simply do in a knee-jerk fashion. I think we've got to think it through," Obama said. "But I have to reiterate once again that we only have one president at a time. And I want to be very careful that we are sending the right signals to the world as a whole that I am not the president, and I won't be until January 20th." Larijani was speaking two days after Iranian President Mahmoud Ahmadinejad congratulated Obama, the first time an Iranian leader has offered such wishes to a U.S. president-elect since the 1979 Islamic Revolution. One analyst said the welcome was a gesture from the hard-line president that he is open to a more conciliatory relationship with the United States. Relations between the United States and Iran have historically been chilly and have been further strained in recent years over Iran's nuclear program. Tehran insists that the program exists for peaceful purposes, but the United States and other Western nations are concerned by Iran's refusal to halt uranium enrichment activities.